She’s a deeply troubled and fragile woman. She was definitely victimized somehow, somewhere at sometime. The people she claimed were at the party, the attack at which she cites as the sole source of her mental anguish and current anxieties, say that they either hadn’t met Brett Kavanaugh, he wasn’t there, or say her story didn’t happen. They issued statements to this effect to the committee. This is called testimony which is called evidence. I’m glad Kavanugh’s family prays for her. We all should. Ford has told several different stories about who and how many people were there at the time of her attack. At times she said there were four boys in the room with her, two boys, or a combination of others. There were four people at the party, then six, then possibly many others. It’s understandable that there would be confusion on this, but Ford stated in letters, therapy notes, statements, reports and interviews DIFFERENT information and claimed all were true. Key events of the night of the attack don’t add up. She claimed Brett Kavanaugh laughed at her after the attack while either going downstairs or when was already downstairs. If you were paying attention to her testimony yesterday, you found out that she did not actually hear conversations, laughter or anything from downstairs, that she only *assumed* that was what was transpiring because it was a party. There was music playing downstairs, there wasn’t music playing downstairs. There was now soft music playing in the room where the attack occurred. Well, at least that was her latest iteration. Stay tuned for more tweaking of this story. It’s important. Could you hear what was said downstairs? Could you hear the evil laughter she claims came from the bellows of Brett Kavanaugh? She had five estimates of the timeline for the attack. Five. She couldn’t definitively say which was one right but *thinks* it might have been 1982, a summer for which #Kavanaugh has calendar records and shows he wasn’t anywhere near her. In order to ‘pass’ her polygraph, she offered only that the incident happened during a summer of her high school years. We found out that she was “going out with” the guy who is a dead ringer for Kavanaugh, whom Ed Whelan suggested might have been the guy who did this groping. He was the mutual friend of both. There were no follow ups on this by anyone today and this was huge. It would be nice to see the therapists notes on this relationship. This guy sent a letter to the committee claiming it wasn’t him. Two other men sent letters to the committee claiming they may have been the groper. Her house was six+ miles from the country club. She claims the house, which she can’t pinpoint, was near that club. She doesn’t remember how she got there. She doesn’t remember how she got home. Trauma could explain this. Or not. We found out that Dr. Ford couldn’t remember if she had given her therapy records to the Washington Post or summarized them for the reporter. Why is this important? Because it had just happened in the last few weeks. She “couldn’t recall,” “couldn’t remember.” That doesn’t ring true. Speaking of which, Dr. Ford at least twice resorted to explaining memory function, not a speciality of hers, instead of answering the question before her. For example, she was asked if her phobias, anxiety and PTSD, could possibly have had other contributing factors, not only this groping attack in high school. Dr. Ford sees TWO therapists, one for her marriage and an individual therapist. As she was explaining the hippocampus and how chemicals affect it, her failure to answer that obvious question was on full display. People had to ask ‘why’? It was not believable. 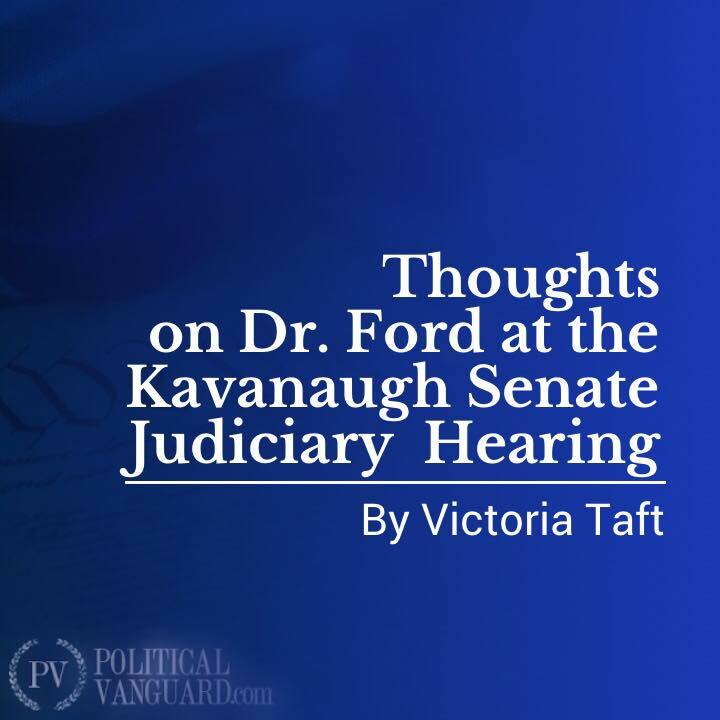 It would be worth knowing if Ford has had other recovered repressed memories about other people in her life. My life experience, not expertise of any kind beyond that, tells me I’ll bet she has. I know someone who in the 1980’s “recovered” her “repressed” memory of her dad sexually abusing her. It involved wild tales of places she’d never been and people whom her family didn’t know. She later said she’d been undergoing therapy and had “recovered” these “memories.” She’s subsequently recanted these fairy tales and reconciled with her family. Note that in the 1980’s recovered memory stories were all the rage. Just ask the McMartin preschool owners. Dr. Ford couldn’t come to the hearing, Senator Grassley, the Chairman of the committee, was told because she has a fear or flying. This excuse stalled the hearing for several days and dragged out the agony for the Kavanaugh family, according to the judge. So does she or does she not have “fear of flying”? We found out from her testimony that she often flies for work, to visit family and to take her surf vacations in French Polynesia, Hawaii, South Pacific Islands, Costa Rica, San Francisco and Delaware. As she put it in testimony, “It’s easier going that direction when it’s a vacation.” If you *don’t* have fear of flying you’re crazy, if you ask me. But she clearly has had a miraculous recovery every time she flew to all those places. She lamented that she had to board a plane to testify, knowing that that it was “unrealistic” to expect Senators to come to her. She claimed that she was not aware that indeed Grassley has offered to come to her *anywhere in the world* to get her testimony to spare her the circus. The offer was made last week over a period of days and was in the news. Her claim not to know strains credulity. Most importantly, she made up information to fill the space in her story: from the music (could anyone hear the struggle), to the location–SIX MILES from her home but she couldn’t remember how she got to or from the to the “laughter” she ‘heard’ but admitted she never heard. This is not hyperbole. She admitted that she didn’t know facts, but admitted adding them later because she assumed the information would be true. She made it up. “That’s my best estimate of how this could have happened.” This research psychologist made stuff up to fill the void in the story. How much did she embed into her own hippocampus. She claimed that an FBI investigation, which Democrats clamor for, would make her “more helpful” in remembering her her own attack. The people she claims were there, the witnesses, have already testified to the Senate investigators that nothing happened or Kavanaugh wasn’t there. Exactly who are FBI agents supposed to talk to? She dared not tell her parents what her plan to testify in the Kavanaugh matter was. WHILE SHE WAS STAYING WITH THEM THIS SUMMER. Her family, specifically husband, did not come and back her up, though wrote out an affidavit in support of his wife. That’s nice of him. Throughout her testimony she selectively emoted with a cry in her voice complete with dry ‘tears.’ Turned it on and off. Not a good look. Finally, again, she had NO corroboration of her story. All of her ‘witnesses’ said her story was wrong.